No results found in Readers Respond . 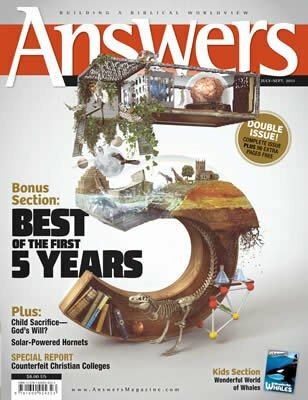 Answers magazine is now in its sixth year of publication. To celebrate, we’ve produced a special double-length issue that features “the best of the first five years.” In addition to our regular departments and many new articles, we show all our timeless favorites (making this a truly collectible edition!). This special commemorative issue also makes a great gift item, which you can share with others who need to be challenged, encouraged, and equipped with some of “the best” in modern biblical creationism!